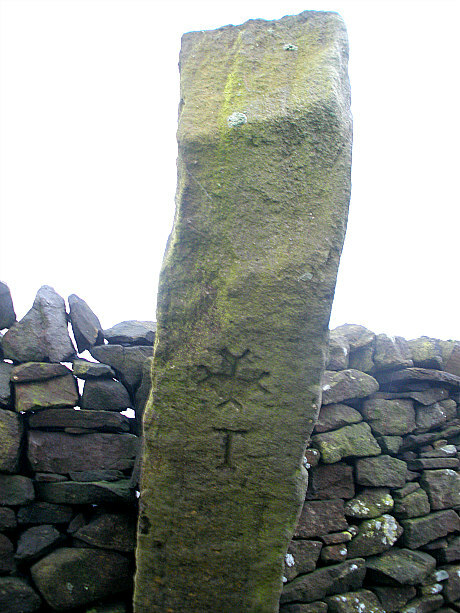 The Pole Stoop Stone, near Cowling, west Yorkshire. OS Grid Reference: SE 0153 4169. 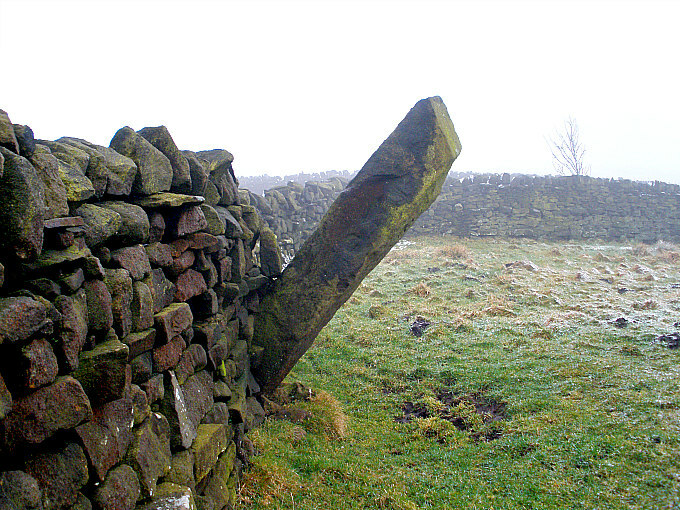 Halfway between Cowling and Keighley, west Yorkshire, is the boundary stone known as ‘The Pole Stoop’. It is an interesting stone in that it has a decorative, florated cross carved onto it, which is different to many other similar stones that tend to have just Latin letters on them, although this stone does have a Latin letter carved onto it. The Pole Stoop juts out of a field wall close to Pole Road, between High Pole Farm and Green Syke Farm. A footpath goes through the wall at the side of the lane, then to the right, and at the drystone wall you have the leaning stoop stone, located on what was the old bound-ary of Lancashire and west Yorkshire, some 4 miles east of Cowling and 2 miles south-west of Sutton-in-Craven. The Pole Stoop Stone is a 7 foot-long slender block of gritstone that leans out from the wall at a precarious 45 degree angle, but originally it was a free-standing stone and probably up-right – the wall being built up to it in the last 100 years or so. Or was the stone meant to lean (stoop) and point in the direction that it does? We do not know when the stone was erected here – some think it was the 15th century, others think it was the 17th century. In the middle of the west face there is carved a very nice florated cross and just below that a letter “T” is carved. This Latin-style letter and the cross were probably carved by the person who set up the stone, or maybe by the landowner wanting everyone to know that “here” lies the county boundary. But the stone would obviously be useful as a ‘waymarker’ stone to travellers traversing the moor, but being different to a milestone in that it had no hands pointing to the nearest village and no mileage numbers. There are other odd looking stones in the vicinity, and ¼ of a mile to the north, beside a farm gate along Green Sykes road, is ‘The Sutton Stoop’, a 4½ foot-high stone pillar with a cross and the place-name “SUTTON” carved onto it. Categories: Boundary Stone/Waymarker | Tags: The Pole Stoop Stone at Green Sykes near Cowling in West Yorkshire | Permalink.